Goodreads summary: "Aria is a teenager in the enclosed city of Reverie. Like all Dwellers, she spends her time with friends in virtual environments, called Realms, accessed through an eyepiece called a Smarteye. Aria enjoys the Realms and the easy life in Reverie. When she is forced out of the pod for a crime she did not commit, she believes her death is imminent. The outside world is known as The Death Shop, with danger in every direction. They come together reluctantly, for Aria must depend on Perry, whom she considers a barbarian, to help her get back to Reverie, while Perry needs Aria to help unravel the mystery of his beloved nephew’s abduction by the Dwellers. Together they embark on a journey challenged as much by their prejudices as by encounters with cannibals and wolves. But to their surprise, Aria and Perry forge an unlikely love - one that will forever change the fate of all who live UNDER THE NEVER SKY." So people have been going "OMG! THE NEVER SKY!" for a couple of months now. The summary left me with a big questionmark over my head, but don't let that deter you, this book is le awesome! This book was the book that after 5 books ranging from meh to really enjoyed it, got me LOVING it. It took some time to get used to the society and we are pretty much thrown right into the action as it starts with Aria being caught in a fire and getting thrown out of Reverie. But slowly I got to know Aria and Perry and Roar and all the other characters that make this book into the wonderfulness that it was. I absolutely LOVED Perry! And Roar! Don't get me wrong, I also loved Aria, but Perry and Roar just stole my heart. The boys are amazing and I loved how Perry struggled with his abilities and with Aria and his loyalty to his family... I felt everything right along with him and I love it when that happens! Perry had lots of amazing Perry-moments (and you guys, the moment on the tower with Aria!! ), I hope you all discover them as well! The Aether in the sky is fascinating and I'm very much hoping we'll learn more about it, like how it came into being, if it causes other things than we've already seen. But most of all I'll be reading the next book because I want to find out what happens next! And to get my Perry-fix, cause that boy ran off with my heart! I'm happy to say this book didn't end with a cliffhanger, like so many books in series seem to do these days. So instead of making me go WHAT? NO!!! it left me with a smile on my face and an intense desire to have the next book ASAP! Really happy to see your positive review as I've just started reading this! Not really met Roar yet so interested to see how he fits in. I can't wait to read this book! Nice review & thank god there's no cliffhanger! I'm so glad you enjoyed it too :D I absolutely ADORE Roar! He's just such a funny and friendly character! And agreed, the ending was different, in the best way possible. I have this on my TBR list and with every review I read about it I get more excited to read it! Great review. It took me a while to get in to this book but once I did, it moved pretty well. I actually didn't like Roar quite as much but I loved Cinder and want to know much more about him. 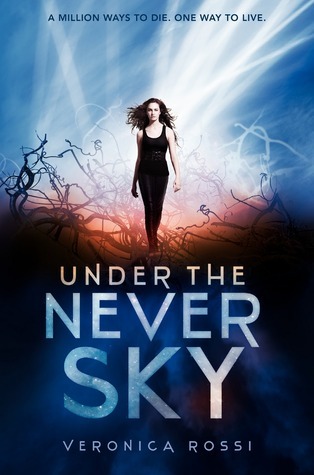 Under The Never Sky is the BEST opener to the coming Year!Right from the very first pages you will know that you would have to cancel your daily chores and activities and cuddle up to this book. Because it will grab your attention from start to finish! Expect sleepless nights!